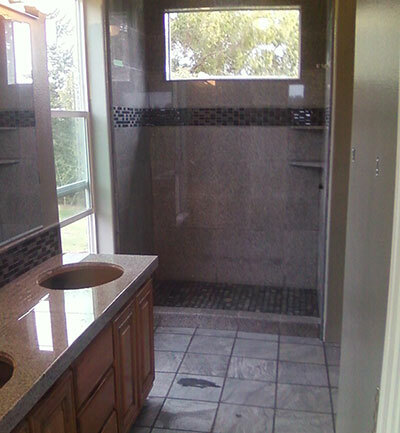 All the materials we use are ideal for bathroom remodeling and renovations. Tiles, granite and mosaic are all non-porous and water resistant so they will stand up to the high level of moisture. Along with the ease of maintenance it is not surprising that we have done so many bathroom projects for the people of Mckinleyville. Whether you merely want to redo the flooring or completely revamp your bathroom, Anthonys Tile can do it for you quickly and at a cost effective price. Many of our customers have mixed and matched the materials we work with to create beautifully textured bathrooms. Tiled floors, marble sink basins, mosaic wall tiles and countertops, in matching or complementary colors combined to make a restroom that is truly yours. If you can’t stand the heat then get out of the kitchen- the old adage goes. For Anthonys Tile this old saying takes on a different meaning but it is no less true. We have always found it a bit odd that so many people use materials like wood for their kitchen floors, countertops, walls and backsplash. The kitchen is the place where most house fires start so why would you want flammable materials there? All of our materials can stand the heat, so besides looking great you are also protecting your home when you have your kitchen remodeled with tile, granite or mosaic. 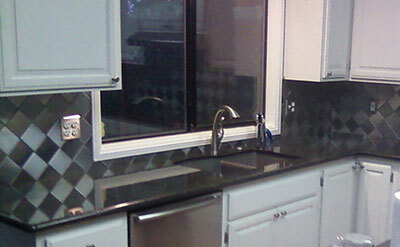 So the next time you look at your Mckinleyville kitchen and think of renovating or remodeling remember Anthonys Tile. Having tiled floors and walls is not limited to the kitchen and bathroom. Tiled floors work for any space because they can match any motif or design, are durable, quick to install, simple to clean and hypoallergenic. Tiled walls give a slick, clean feel to any room either as a complete wall covering or as an added decorative touch. Many of the tiles Anthonys Tile supplies to the people of Mckinleyville have raised and elevated designs to give an extra layer of texture to the walls of your space. Ceramic, porcelain or marble tiles there is sure to be something for you. And if you want to have a unique piece of mosaic to solidify a theme we can custom create that too! With so many materials, designs, colors and textures you are certain to find something for your outdoor Mckinleyville project with Anthonys Tile. Tile walkways are one of our most popular products we install for the people of Mckinleyville. They last a very long time, are easy to clean, and slip resistant. Of course, tiles are also great for protecting and beautifying exterior walls. Moreover, Anthonys Tile can create edging for your pool, a sturdy porcelain tiled deck, marble benches, a mosaic design for an exterior wall and so much more. Contact us today to start on your way towards a stunning exterior. A crackling fire on a crisp evening is a great way to bring friends and family together to create memories. However, when you look at your Mckinleyville fireplace is it what you want people to gather around? Anthonys Tile can give you the fireplace to bring both the space and people together. Most of our fireplace project requests are done in marble as it is has a classic appeal. Gas, electric or wood burning fireplaces; Anthonys Tile has many designs to choose from or we can make custom fireplaces. Indoor or outdoor, we have exactly what you need when it comes to excellent fireplaces that are reasonably priced. All information provided is provided for information purposes only and does not constitute a legal contract between Anthonys Tile and any person or entity unless otherwise specified. Information is subject to change without prior notice. Although every reasonable effort is made to present current and accurate information, LinkNow!™ Media makes no guarantees of any kind.